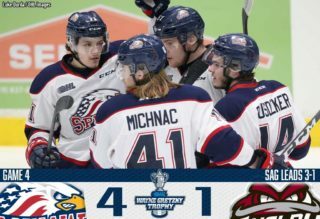 Saginaw, MI – Far from being a modest points streak, a sheer seven games, the wheels keep moving just a bit faster for the Saginaw Spirit after Saturday’s 6-4 victory over the Erie Otters at The Dow Event Center. Stringing together back-to-back wins to begin the second half of the 2018-19 season, the Spirit continue their ascent in the OHL Western Conference standings after seizing 13 of a possible 14 points since December 8. Saginaw takes home its third straight win over the Otters and six of the last seven meetings dating back to last season. Under the guidance of head coach Chris Lazary, the Spirit improve to 9-2-1-1. Over 10 minutes of scoreless play in the first period was ended by the Otters at 11:02, the second time in the previous two meetings between the American-based clubs this season in which Erie has scored first. A wrist shot inside the right circle on a breakaway by third-year forward Danial Singer would be his second goal in two straight games, upping his points streak to five games. The Spirit scored twice before the opening intermission, both of which would tie the score, including a back-door pass in the slot by Jake Goldowski to Detroit Red Wings draft pickBrady Gilmour for the 1-1 tie at 13:31. Watching the puck trickle past 18-year-old Erie goaltender Daniel Murphy to the bottom left corner, the goal for Gilmour was his first since returning to the lineup Friday at Sault Ste. Marie. Gilmour missed four games due to injury. The 2017 seventh-round draft pick became one-of-ten Spirit players to surpass the 20-mark in points while his 14 assists are fifth best on the team. The final two goals in the period came within two minutes of each other, beginning with Kyle Maksimovich collecting his 20th of the season on the power play at 15:59 to extend his point streak to eight games. The Spirit came into the game with the league’s 13th ranked man-down unit after killing four penalties in the win at the GFL Memorial Gardens. Maksimovich, the overage left-winger, currently ranks in the top-10 among all OHL players in points (49) and leads the Otters in goals (20) and assists (29). Saginaw only trailed once to Erie prior to Saturday. Another Spirit veteran who was introduced back into the lineup against the Greyhounds also notched his first goal before the second frame. With 2:05 left, former first-round pick in the 2014 OHL Priority Selection, Reagan O’Grady, would grab his third since being acquired via trade on September 23, wrapping the puck around the net before Murphy could react to make it 2-2. O’Grady was absent for a majority of the month of December with an upper body setback. The overage defenseman erased an 11-game scoreless streak as Cole Coskey and Cole Perfettiwere credited with the assists. Coskey was among 29 players auditioning for a roster spot on Team USA earlier this month in the 2019 International Ice Hockey Federation Work Junior Championship. Coskey scored the game-winning goal over Sault Ste. Marie to take sole possession for most goals (16) by a Spirit player. Coskey’s point streak ups to seven games, finishing with three points in two games during this stretch. Meanwhile, Perfetti ranks in the top-10 in goals (15), assists (14) and points (29) among all OHL rookies this season. Shots on goal favored Saginaw after 20 minutes, 13-9. The Spirit tied it up at three goals apiece at 10:05 in the second on their fourth power play goal in four games. 2018 New York Islanders fifth rounder Blade Jenkins’s tip-in would be his seventh for 15 points in nine games. A native of Jackson, Michigan, Jenkins has totaled two goals and four assists for six points against the Otters this season. Tied with Coskey for the third most assists (21) and third in points (35), Jenkins has seen a significant rise on offensive production since the position change earlier this month. The power play for Saginaw was listed at sixth overall leading up to Saturday’s game with a 23.7 percent success rate. The Otters were 15th with a 17.9 percent success rate. Just 1:10 into the second saw Maksimovich garner his second point on an assist off second-year forward Maxim Golod’s eighth goal of the season. A short pass to the slot while Ivan Prosvetov was sprawled on the ice was enough for Golod to earn the wide-opened opportunity. Prosvetov, whose last appearance against Erie on October 6 ended in the 2018 Import Draft first rounder making 28 saves for his second career OHL win, picked up his fifth consecutive win in net dating back to December 9. An Arizona Coyotes prospect, Prosvetov improves his goals against average (GAA) to 3.32 with a .894 save percentage (SAV%), after stopping 31 shots for a record of 17-6-1-0. Accounting for back-to-back assists on the Jenkins goal and the Damien Giroux rebounder in front of the crease at 13:17 was 2018 New York second-round draft pick Bode Wilde. As the Minnesota Wild prospect carved out his 15th goal of the season on the power play and first since December 14, the multi-point outing for Wilde would be his 13th this year. Signing a three-year, entry-level contract with New York on December 3, Wilde is tied for the second most assists (27) and is fourth in points (36) by a league blueliner in just 29 games played. Once Saginaw obtained the go-ahead lead following the Giroux score, Perfetti and Coskey would also register their second point of the night. Along with leading the team in goals, Coskey is at the top in points (37) as well. Saginaw went into the locker room at the second intermission after scoring their third unanswered with 4:39 remaining for the 5-3 lead. Able to keep his balance after being checked inside the circle, second-year forward Nicholas Porco captured his second goal in four games and fourth against the Otters this season. 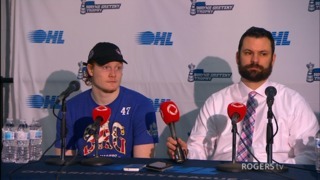 The assist by O’Grady signaled his first multi-point performance while donning a Spirit jersey. After recording a goal and assist against Sault Ste. Marie and responsible for the secondary assist on the Porco score, second-year forward Duncan Penman has earned at least one point in three of the last four games. Similar to the first period, it took just under 14 minutes before Saginaw added its fourth in a row from Danny Katic, who increased his point streak to four games. Assisting on the Gilmour goal, the former 2016 eight rounder has gained five points since December 15. Erie second-year forward Chad Yetman would stop the bleeding with 4:31 left to play for his 15th goal and 30th point of the season. Saturday was the first game the Spirit allowed more than three goals in a game since December 1. Paw Patrol characters Chase, Marshall, Rubble and Skye will be at the Budweiser Red Room tomorrow from 4:00-7:00 p.m. for meet-and-greet and photo opportunities. Fans are also encouraged to bring their hockey equipment and join the Spirit players for a postgame skate. 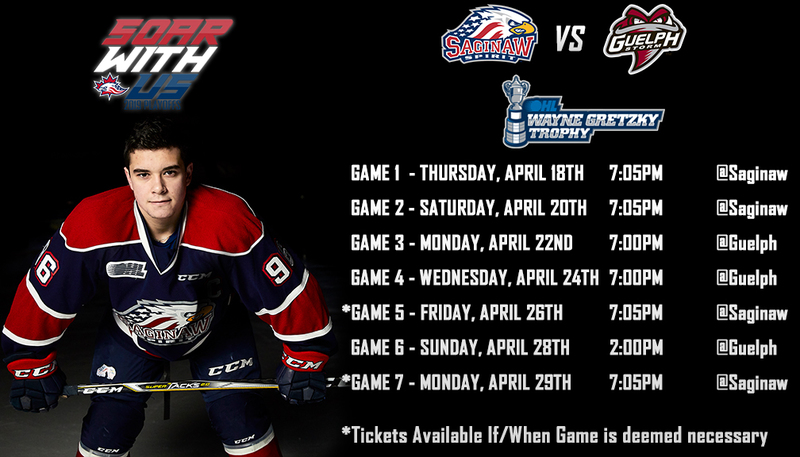 Tickets for children 12 and younger are available for $5, courtesy of Covenant HealthCare, as the Spirit host the Flint Firebirds at The Dow for Game 4 of the Coors Light I-75 Divide Cup series. Listen live on the flagship WSGW 100.5 FM Talk & Sports and fmtalk1005.com with Joey Battaino and Dennis Desrosiers. Pre-game coverage starts 15 minutes before puck drop. 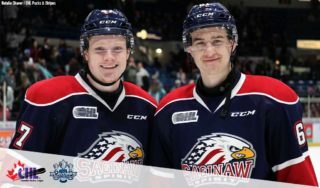 Saginaw has won five consecutive games against their in-state rival, compiling a record of 11-0-1-0 in the last 12 meetings, including a 4-2 final on November 14 at the Dort Federal Event Center.